Last week's Integrated Systems Europe (ISE) at the Amsterdam RAI drew record numbers of exhibitors and attendees from around the world for four days of business, education, and networking. It was the largest show in ISE's 15-year history. Below are event details and official figures released today by the Integrated Systems Europe team. "Throughout 15 halls, visitors experienced a vibrant showcase of the latest AV and systems integration technologies, products and solutions as ISE confirmed its position as the international destination of choice for AV professionals. The number of exhibitors totaled 1,296, of which 294 were exhibiting at ISE for the first time. Combined, they filled 53,000-sqm of exhibition floor space. Floor space already confirmed for ISE 2019 currently stands at 103% of the total booked for ISE 2018. The number of registered visitors by the end of the show had reached 80,923, an increase of 10.3 percent on the 2017 edition. Importantly, almost 20,000 visitors attended the last day of the show. On a distinctly positive note, over 30 percent of the total attendees were visiting ISE for the first time, a key benchmark for exhibitors in their quest to develop new sales leads. Highlights of the show included: an Opening Address from architect and inventor Carlo Ratti that explored the evolution of smart building and ‘Senseable Cities’, nine dedicated B2B conferences covering a wide range of AV topics from innovation and design to theme park ‘night-time spectaculars’, a Stand Awards competition, ‘Tech Tours’ to three leading AV installations including the Amsterdam ArenA and five days of professional development programming curated and delivered by AVIXA and CEDIA. ISE 2018 also saw the debut of the World Masters of Projection Mapping competition, a joint venture between the Amsterdam Light Festival, RAI Amsterdam and ISE. The competition saw leading video artists’ project video artworks onto the EYE Filmmuseum in the centre of the city. The competition culminated in Florian and Michael Quistrebert receiving the winner’s award for their artwork Stripes 5 on the last day of the show. Many exhibitors once again used the show as a launchpad for hundreds of new products, technologies and solutions. Technology and business trends included: a growth in IP and the crossover between broadcast and AV; commercially viable virtual, augmented and mixed reality technologies and solutions; the increase of devices for the smart home; the divergence of digital signage with both smart systems and ‘plug and play’ gaining traction; the increase in small pitch LED displays; 4K everywhere; IoT everywhere; the growth of projection mapping; networked audio and the continued progression of the collaboration market. For both AVIXA and CEDIA, the show provided a unique platform for the associations to reinforce recent initiatives and to cement their key role as providers of exemplary professional development programmes. 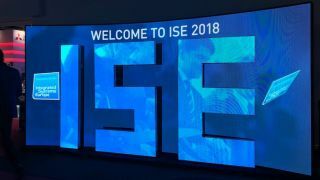 ISE 2019 will be held at the RAI Amsterdam from 5-8 February 2019."